The Touch Screen Tablet Computer is playing an increasing role in today's society. Since the announcement of the first generation Apple iPad in 2010, a plethora of companies are investing huge sums to develop the next big thing in mobile computing. Tablet makes, models, hardware capabilities and software, including operating systems and applications, is fiercely competitive. Markets rapidly shift focus and models quickly become obsolete. Therefore, if you are looking for a Tablet, and the market is so fluid you are spoilt for choice, how do you decide what is best for you? In this article we look at the reasons why a touch screen tablet computer is appropriate for you. We review the benefits of such devices, and look at what is available on the market at present. My aim is to provide you with overall information on which you can make an informed choice about the best device for you. A relative (or extension) of the Tablet is the Hybrid, or Tablet Notebook Computer. This is a tablet device with a detachable keyboard or non-detachable keyboard that swivels 180° behind the tablet screen. The aim of these devices is to provide you with the best of both the Tablet and Laptop worlds. Is this type of device more appropriate for you? Take a look at the article for further details. The Tablet computer is a convenience device. Light, easily portable, and lots of battery power. Tablet devices are less cumbersome than laptops and larger than smartphones, particularly useful for watching movies and other streaming multimedia. In addition the solid state hard drive's that come as standard in tablet devices are very quick at loading the operating system and applications - much quicker than desktop computers or laptops. What it comes down to, like it always does, is what do you want/need to do on your tablet? Depending on the type of tablet you buy, they can be expensive. You don't want to buy one only for it to collect dust in a drawer because you have no real use for it. If you believe you have a genuine need for a touch screen tablet computer, there are a few things you need to be aware of upfront. Companies such as HP, Dell and Panasonic also produce tablets aimed at the business market. We look in more detail below at the different types of hardware specifications available today. The are three main operating systems on the market today. There are others but these 3 are currently the big players in the software market. Apple's iOS is the market leader. However in 2013 sales of tablets with the Android O/S overtook the iPad. Personally I find all 3 easy to use. Ultimately it is personal preference which is best for you. No harm in trying all though, is there?! Whichever tablet and O/S you end up choosing, it is likely for the duration of your ownership/subscription, you are going to be tied in to that providers offerings. Next we look at some of the things to consider before buying your tousch screen tablet computer. The information below is intended to be an unbiased set of criteria for you to consider before investing in a touch screen tablet computer. Some of the specifications will change as technology evolves. However the principles of selecting a touch screen tablet computer remains the same. Is the design, style and colour of the device appealing to you? Does it matter to you? Hardware features - Do you need USB or HDMI ports? Do you need a high quality web cam? At the time of writing the largest touch screen tablet computer screen size is about 11 inches which is offered on devices such as the Dell Venue 11 Pro. Some Samsung Galaxy models offer up to 12.2 inches, and even 13.3 inches in some cases. 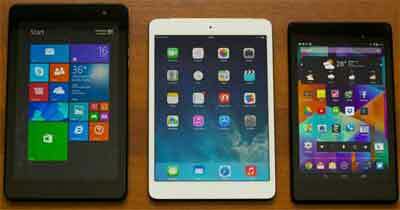 7 inch screens are considered small, even though only 4 or 5 inches separate smallest from largest. For what tablets are generally used for this is a big difference! The Venue 11 Pro is a Windows device aimed at business professionals which also doubles up as a hybrid device if you pay the extra £63 or £100 for the physical keyboard attachments! The screen size of a tablet is the actual size of the touchscreen, measured diagonally, just like a standard TV. The actual size of the tablet are in most cases bigger than this. Tablet display information can get quite detailed and complicated. For example things like pixel density per inch (ppi) is different to standard screen resolution. Pixel density refers to the the sharpness of the display depending on the distance you are from the device. A low Pixel density means the further away you are from your device the more distorted the screen becomes. Apples' Retina Display ensures the typical viewing distance of your tablet does not show any individual pixel. The sharpest model on the market today with the highest screen resolution is the Amazon Kindle Fire HDX with an impressive 2560x1600 screen resolution and 339 PPI. This particular device comes with its own Fire OS 4 'Sangria' Operating System. Expect this quality to improve over the coming years! Storage and RAM are also important considerations. Most vendors now offer Cloud storage free of charge so you can access your data from anywhere at any time. However 'on board'/local storage is important, particularly if you use a lot of Apps and keep music, video and photographs local on your device. Most non-Apple devices offer up to 64GB of storage. Apple offer up to 128GB. Related to storage is memory (RAM). More is better in both instances. If you use a lot of apps then more RAM makes your device more responsive (a decent Processor/CPU is also a must). Most Android based devices offer the ability to add storage via microSD Cards. Although not as quick as your internal SSD storage, it is a cheap method of increasing your devices storage capacity. At the time of writing Apple do not offer this option on their devices. However products such as the iPocket Drive (Opens New Window) and the Leef iBRIDGE (Opens New Window) provide suitable alternatives. Battery life in tablet devices tends to be a standard 8 to 10 hours today, lasting much longer than a laptop. Wi-Fi and Bluetooth are also standard. 4G 'Mobile' connectivity for access anywhere tends to be more expensive. If you are using your device in an area with free Wi-Fi hotspots, you may not need 4G connectivity. Most mobile suppliers offer monthly data purchases for tablet devices without signing up for a 2 year contract. If you have a mobile phone contract you can tether your touch screen tablet computer to your mobile phone. This means you can buy a tablet without 4G capability but connect online via your mobile phone. The video below explains one of many ways to do this. Older (7 inch) Android devices generally cannot be upgraded to new versions of the Android O/S. Check before you buy! 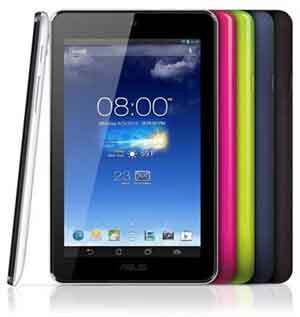 Android devices are usually cheaper than Apple or Windows tablets. In recent years cheaper Androids mean poorer quality. Not so much today! All Tablets have optional extras. However at the time of writing Android offer the widest variety such as USB Ports, meaning you can plug it in to your PC to act as a storage device and transfer files etc. Nothing beats trying for yourself. Go down to your local dealer and spend a bit of time in there with each type of device you are interested in. Next we look at Tablet Operating Systems. The Microsoft Windows O/S is found on the Microsoft Surface Tablet and generally on other Business focused devices. Android is a free, open source O/S which explains why so many customised versions exist on so many devices. Unfortunately most android devices do not receive O/S upgrades like the iOS. If you want the latest Android O/S (KitKat 4.x) and/or android O/S upgrades, speak to your local provider for advice. The Windows O/S is licensed to Microsoft. For other vendors to use requires payment of a license fee. The big benefit of a Windows O/S is the capability of running full applications in addition to cut down tablet Apps. This is one of the reasons why the business tablet market prefers Microsoft software. The other side of the coin is true with tablet Apps you download and install. No need for license keys and working through installation sequences. It is also the reason why Windows based tablets double up as a Hybrid device so well. Apple manufacture their own hardware and develop their own O/S specifically for their devices. This is why Apple is usually more expensive but at the same time gives credence to their claim of truly integrated and compatible hardware and software. When selecting your tablet you decide whether this an important factor. Android devices have the capability of multi user logins. This means several members of your family can login to their own profile and customise however they see fit. Windows devices also offer this standard feature. However the Apple iOS does not at the time of writing. 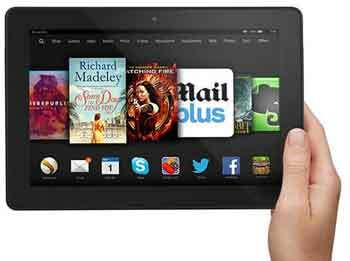 Customised Android devices such as the Amazon Kindle fire are specific to that device, and cannot be amended easily. For example, Google Apps and Play Store are replaced by Amazon equivalent services. In addition, consider security. Not a long time ago Microsoft received the most attacks by cyber criminals. Today Andriod receives just as many, if not more attacks on its vulnerabilities. If security is important look no further than Apple. Next we looks at Apps. Apple offers the widest and most secure range of Apps today with their App Store. Whether the App is free or to purchase, all can be done on your touch screen tablet computer. The App Store is closely monitored to ensure no rogue apps with malicious code built in is made available for download. Android has an increasingly good selection and Apps. The main security issue is the Android Play Store is not monitored well (or at all). Therefore, even though more Apps are free of charge, they come with the risk of infection or faulty code. If it seems to good to be true then it probably is! It is also worth mentioning that some Android Apps are written for smaller smartphone screens. This means on a touch screen tablet computer with a 10 inch screen the App won't render too well and may look poor. Microsoft is also offering and increasing number of Apps but is still way off the pace of both Android and Apple. On the face of things Apple seems to win the day when it comes to Apps. However, bear in mind that with apple, everything is tied in; Apps, Films/TV Series (Apple TV), Books etc. With Android you can shop around different sources for the cheapest books, Apps, Movies etc. Is this an important factor for you? There is lots to consider, when you look at it, buying a touch screen tablet computer. Whichever make and model you end up with, you are committing to one of the 3 main players. This is not a bad thing, necessarily. If you use an Android phone then why not commit to an Android touch screen tablet computer? Same with the Apple iPhone and iPad. This way everything is seamless between devices which ultimately makes your life easier. The All Touch Tablet Site (Opens New Window) is an excellent source of up to date information on all things touch screen tablet computer related.